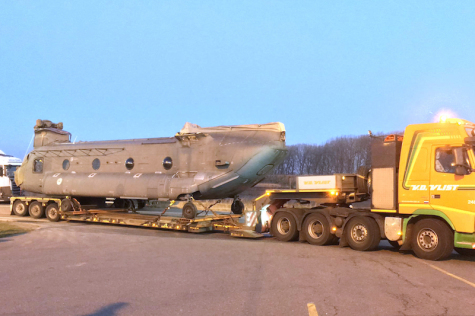 Two Chinook transport helicopters left for the United States from the port of Antwerp yesterday. There, the Chinook CH-47F Foxtrots are being modernized into Foxtrot MYII CAAS (Common Avionics Architecture System). The helicopters have been dismantled for transport at Woensdrecht Air Base. After 20 years of service, maintaining the current 11 CH-47D Delta Chinooks is becoming increasingly difficult and costly. For example, the fuselage is outdated and certain components such as parts of the cockpit are no longer made. In addition, deployment options are declining due to lagging behind in technical developments. The 13 'Deltas' arrived in the Netherlands from 1995 onwards. Of those 13, two were lost in 2005 in Afghanistan. The fleet was expanded between 2008 and 2012 with six new Chinook Foxtrot helicopters. In 2015 it was decided to purchase 14 Chinooks of the new type Foxtrot MYII CAAS. The 11 remaining Deltas will be divested. To get the entire fleet at the same level, the current six Foxtrot models will get an update to MYII CAAS. The Movement Control team of the Defense Support Command brought the first two units stationed in the Netherlands to Antwerp. The remaining four are already in America for training purposes. The first updated Chinook is expected at the end of 2020 at the Defense Helicopter Command in Gilze-Rijen. The transition must be completed by mid-2022.